Thanks for stopping by for this months Creative Cuts and More Blog Hop, our theme this month is "Baby and Bridal Shower". The Design Team has put together some wonderful projects to share with you. 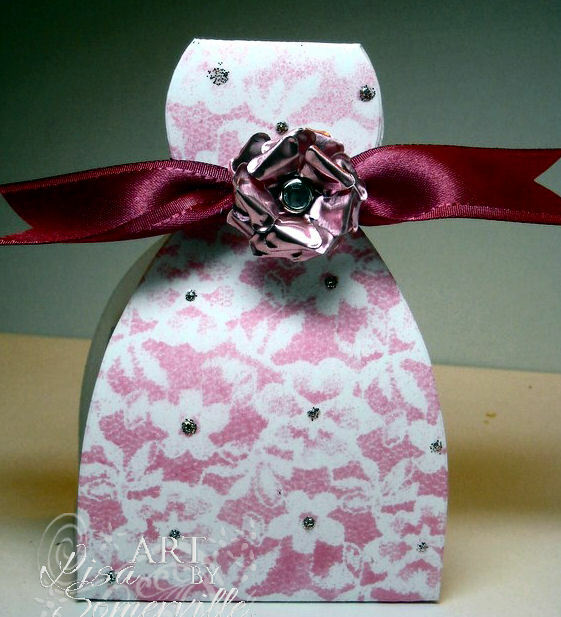 If you didn't arrive from Noelle's blog, you'll want to head back to the Die Cut Diva Blog to start at the beginning. While your at the Die Cut Diva Blog be sure to read the details on how you could win a two tier cake in your choice of a smooth or textured card stock - how cool is that! But that's not all, click here to shop at Creative Cuts and More, then enter code babybridalhop20 at checkout to save 20% on EVERYTHING in the store. But hurry, this coupon code expires August 18, 2010. I went with the Bridal Shower Theme, these would also be perfect for the Wedding Day! I used the following dies to create my projects: Dress Box, Tuxedo Box and Cake Slice. On all my pieces I added Metal Flowers I created with Ten Second Studios Metal and the Tattered Floral Die, adding a Rhinestone to the centers. To create the Bridal Dress, I embossed the White Dress Box with the Stylized Flowers Cuttle Bug Die, assembled the box added some Tiara Stickles, Satin Pomegranate Ribbon and the Metal Flower Embellishment I created. 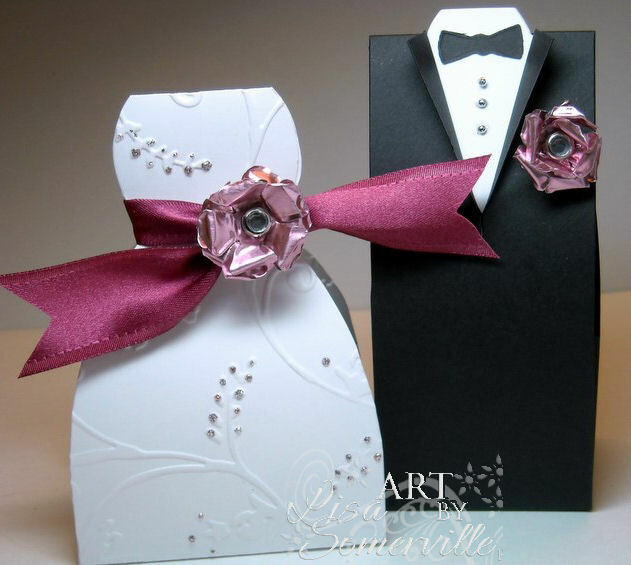 For the Tuxedo Box, I added the Metal Flower Embellishment and Silver Gems. To create the Cake Box Slice, I embossed the White Cake Box with the Damask Texture Fades Folder, added the embossed Brown Metal to resemble Chocolate (sand metal lightly to expose the silver before attaching). Then added the Metal Flowers I created and the Silver Flourish Bling. The Bridesmaid Dress is created with the Dress Box Die Cut, I used the Glimmer Lace Technique using Bubblegum Glimmer Mist to add color. Again I added a Pomegranate Satin Bow, Metal Flower Embellishment and some Tiara Stickles. I hope you enjoyed my projects, your next stop is Darsie's Blog. GORGEOUS Lisa. I just love those foil flowers! You sure created some spectacular eye candy today...very creative! Each and every piece is amazing! Very pretty set! I love the metal flowers too! These are so pretty! Love the "bridesmaid" dress. Those foil flowers are great! Lisa, These are beautiful! I love the flower on the dresses and cake. The dress and tux is incredible, but that cake box is out of this world! Very fancy!! Love it! So pretty, especially the bridesmaid dress. Lisa, these projects are out of this world! These beauties would be a beautiful display at a wedding reception or even on top of the cake. Love the color combination with this fabulous set of projects! The bridesmaid dress is just too beautiful!! Oh wow Lisa these are soo darling! Now you are making me want to buy even more from CC&M!!! Thanks for sharing! I have got to find those metal flowers...will do a search after the hop! TFS! Wow. That dress card is just gorgeous. Aw girl I'm in AW, these are georgous!!!!!!!!!!!!!!!! Very elegant.....love your color choices. Lisa these are GORGEOUS and elegant! Love it! Those are absolutely amazing! I love all the details. BEAUTIFUL!! You did such a wonderful job!! These are gorgeous! Lisa you always do such beautiful work. Thank you for sharing your talents! Love the flowers! WOW Lisa, the flowers are awesome! I love them! I love your bridal examples--esp. the cake; the cake looks elegant! I really love the bridal gown card and your embossing. You have me hungry for cake and THRILLED about templates!!! These are SO spectacular I can't hardly see straight! The photos are exquisite and show off your incredible work beautifully! What a fun way to celebrate such a cherished time! Yee HAW! OMG I have to show my daughter. She gets married next May and if I started today I might be finished in time. Fabulous ideas!! Love what you did with these! Of course I love the masked dress with soft pattern! 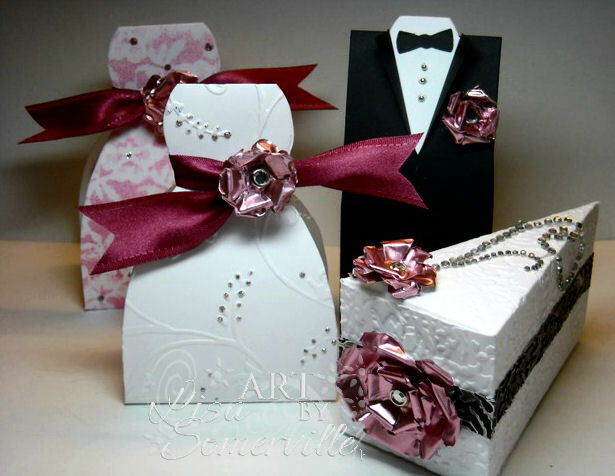 Beautiful set of boxes and those roses you created are fabulous!!! The Bridesmaid dress is my favorite, but, all of your creations are amazing. I am intrigued by the metal flowers - way cool! OMG, Lisa...what a fabulous bridal set!!!! The colors are beautiful and I just love the technique you used on the bridal dress!!!! Beautiful! How did you make the metal flowers? 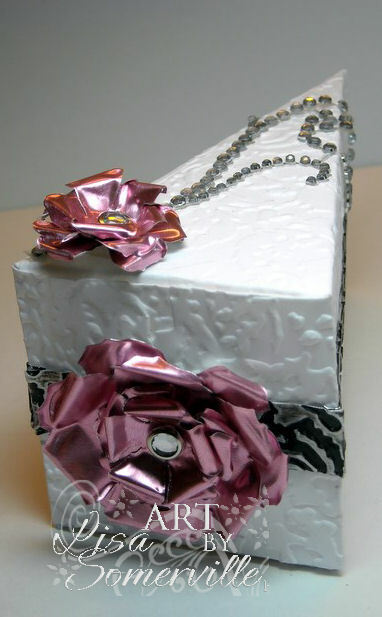 I love the idea for brides maid gifts! These are beautiful projects!!! I love your glimmer lace "dress" and those metal roses!! Gorgeous, Gorgeous, Gorgeous!!! I love the flower and the pearls. Just beautiful! Great ensemble Lisa!